Whistleblower claims, aliens have been in contact with Home Sapiens from the beginning – They have seeded us! In 2003, a U.S. Navy Seal Special Operation team traveled to Antarctica to investigate a perfectly geometric 8-sided octagon structure discovered by ground penetrating radar near the Beardmore Glacier, about 93 miles from the American McMurdo Station. Another previous team of engineers and scientists had dug out the top layer of one of octagon made of a pure black substance that was built on top of two more black octagonal structures that went down deep into the 2-mile thick ice. The specific testimony is by one of the now retired Navy Seals who was there (starts around the 11.20 mark of the video) . He calls himself Spartan 1 and gave me permission to videotape him on July 19, 2018 – as long as he was in the shadow and his voice was altered. But before Linda Molten Howe starts her interview with the retired Navy Seal she talks about Naval officer, Brian, who has worked for twenty years as a technician and flight engineer for the US Navy from 1977 to 1997. Brian told Linda some rather disconcerting things about what he has experienced in Antarctica in the period 1995/96. Several times they saw silver colored flying saucers in the distance over the mountains and once they saw a hole in the ice, the size of a football field. 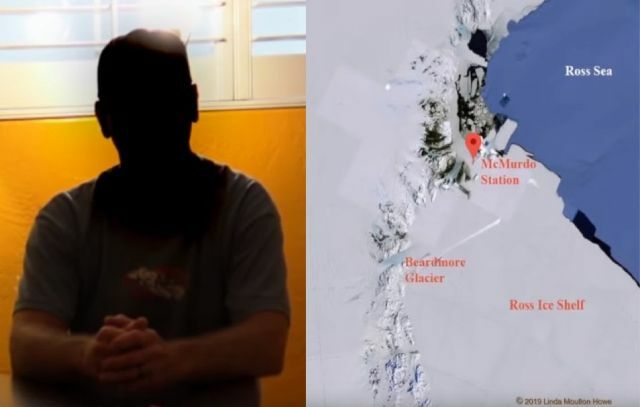 Actually, they ended up there by accident, because the hole was only a few kilometers away from the geographical south pole and in a no-fly zone.